On Saturday 8th September CCR took a journey into the unknown, as they bouted 2 teams that they had not met previously. Slay Belles lined up against Bristol Roller Derby and Centrinnians took on Big Bucks High Rollers, with CCR taking one victory over the course of the day. 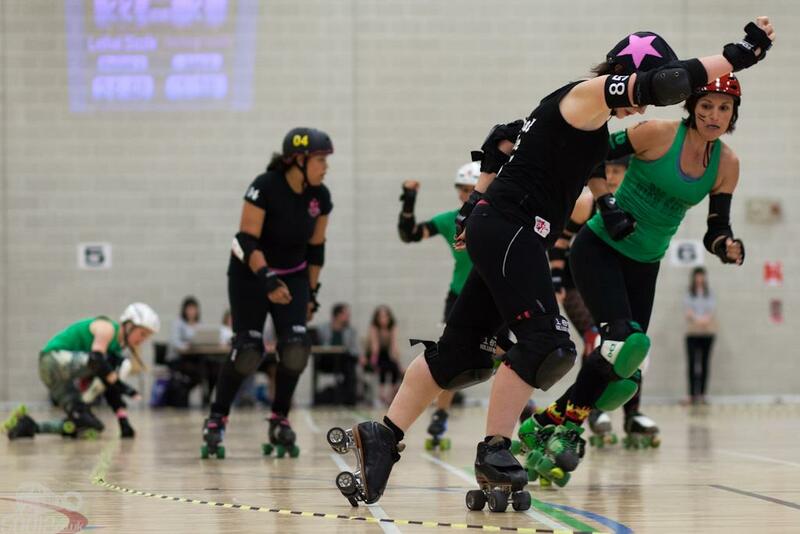 The first game of the day saw Slays take on Bristol Roller Derby. It was a new line up for the Slays who, like most B teams within leagues had a major reshuffle during their off-season, as their previous year’s squad developed. Bristol got off to a good start and effective exploitation of a power play in the second jam saw them open their lead up to 21 – 0. Their fast jammers were able to out manoeuvre CCR packs, while their heavy hitting blockers detained CCR jammers that little bit longer enabling them to dominate lead jammer status and calculated call offs. Bristol’s defence and recycling was very effective, and held CCR from getting any points on the board until ten jams into the game. Although Slays showed no signs of giving up and continued to fight, (with a good helping of ‘ooooooh’ inducing big hits), this kind of performance continued for the full length of the game. Penalties between the two teams were seemingly even and Bristol gave away very few power plays, meaning CCR were unable to claw back the deficit between the two teams. The game closed with a convincing win for BRD, with a score of 211 to CCR’s 24. Roster: 1337 Incredible Hulse (Captain), 101 Cruel Heller DeVil, 1212 Lola Whip, 28 Betty Bloodshed, 29 Gerty Go-Go, 404 Typhoid Mary, 429 Thumperlina, 43 Beth Metal, 434 Dr InKnockulator, 45 Ouija Broad, 707 Jelly Mean, 73 Sweet Fighter, 800 Ghouldilocks, 802 Whipped Green. Bench: Barry Fight, LUM: Woo-Ha! In the second bout Centrinnians took to the floor against Big Bucks High Rollers, determined to not let their season opener end on a double loss. Big Bucks took the first jam of the game with a cautious 3 – 0 early call off. In the second jam however CCR received a power play enabling them to take the lead. Their stationary pack and nippy jammer pushed the score up to 30 – 3. When both teams had their entire 5 on track scores crept up slowly, but in the first half Big Bucks gave away several power jams (5 to CCR’s 1) which enabled the Cents to establish a large lead. Cents also kept tight walls, preventing Big Bucks jammers from escaping on a few occasions, enabling their jammers to enjoy natural grand slams. The first half closed at Centrinnians 140 – 26 BBHR. Big Bucks gathered themselves at half time, determined to bridge the gap and the second half started with the scores evenly and cautiously creeping up jam per jam again. However, Centrinnians’ blockers would not budge, and held their dominant position for the rest of the game. Big Bucks received a power jam of their own halfway through the second half, which enabled them to bump up their first half score considerably, but throughout the second half they were unable to get within fighting distance of the Centrinnians’ scoreline guarded fiercely by their tight walls. The game closed at CCR 238 – 74 BBHR. 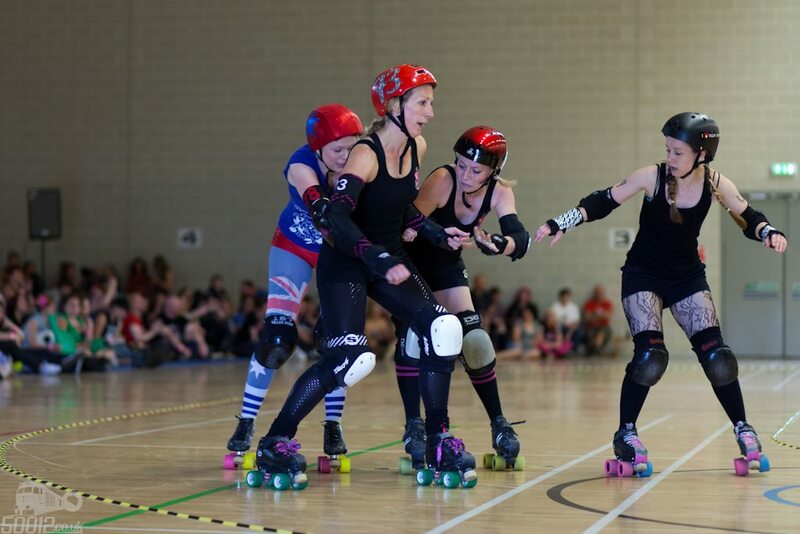 Roster: 82 Hustle’Her (Captain), 42 Agent Dana Scurry (Co-captain), 10 Bunny Massacre, 119 Scarlet Macabre, 27 Germaine Leer, 3 Tinchy Slider, 333 Rubix Crude, 4 Lex Brawl, 404 Typhoid Mary, 54 D’Elusive Del, 666 Tragic Wrath, 69 Verry Cherry, 73 Sweet Fighter, 85 Lethal Sizzle. Bench: Barry Fight, LUM: Woo-Ha! To continue to support CCR you can get details of our latest event to help raise money to attend the European Championships in Berlin in November, a Comedy Gala, here. Tickets can be purchased via this link.